U.S. military veterans ride on motorcycles during the Veterans Day Parade in New York on Nov. 11, 2014. I recently heard someone throw around the statistic that only about 2 percent of all living Americans have served in the military. This seems low, and seems worth fact-checking. As of Jan. 31, there were close to 1.4 million people serving in the U.S. armed forces, according to the latest numbers from the Defense Manpower Data Center, a body of the Department of Defense. That means that 0.4 percent of the American population is active military personnel. That’s not your question though, is it? You’re interested in the percentage of Americans who have ever served — perhaps because as a veteran yourself, you know that former members of the armed services vastly outnumber current personnel. The Department of Veterans Affairs (VA) is interested in a similar question — and to answer it, they use their own data as well as numbers from the Department of Defense, the U.S. Census Bureau, the Internal Revenue Service and the Social Security Administration. 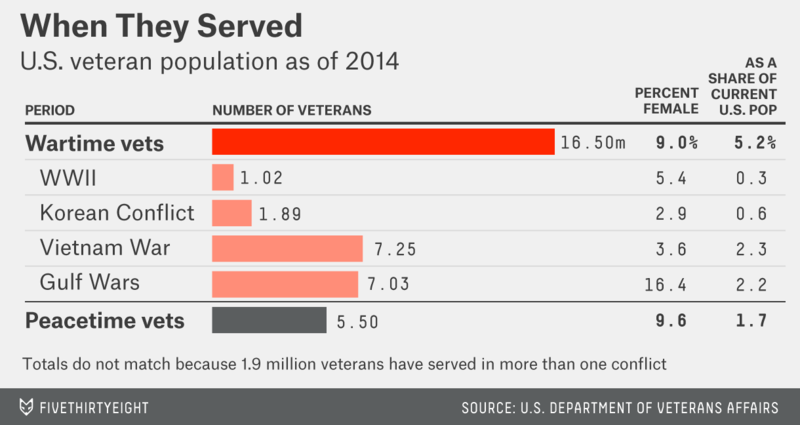 As of 2014, the VA estimates there were 22 million military veterans in the U.S. population. If you add their figures on veterans to the active personnel numbers mentioned above, 7.3 percent of all living Americans have served in the military at some point in their lives. But since only 2 million veterans and about 200,000 current personnel are women, that overall percentage varies a lot by gender — 1.4 percent of all female Americans have ever served in the armed services, compared to 13.4 percent of all male Americans. Seeing as you mentioned specifically that you served in the Navy, I thought you might be interested in a breakdown by branch of service: 3.1 percent of all living Americans have served in the Army, 1.7 percent in the Navy, 1.4 percent in the Air Force and 0.8 percent in the Marines, while the remaining 0.5 percent served in either non-defense or reserve roles. So that number you heard looks like a big underestimate. Perhaps the percentage was based on a younger age group rather than all living Americans (we know, based on that VA data, that more than half of all veterans are over 60 right now). We also know which conflicts those veterans served in. There are 5.5 million living U.S. veterans who served during what the VA calls “peacetime,” meaning they didn’t serve at any point during a conflict — 11,213 of them served before World War II had even begun. “Wartime” veterans are a slightly harder to group to categorize because many of them served in more than one conflict. For example, 2.8 million veterans served in only the first Gulf War (defined by the VA as lasting from August 1990 to September 2001), another 2.6 million served in only the second Gulf War (defined as the period from September 2001 to present) but there are another 1.6 million veterans that served in one of those conflicts as well as another (either the other Gulf War or something else). The VA also calculates the projected population of veterans over the next three decades. Based on its current information (i.e. assuming no future conflicts), the agency expects the number of living veterans to steadily decline to 14.5 million in 2043. Unsurprisingly, the only category of veterans projected to increase are the post-9/11 ones. Their numbers will rise from 3.9 million in 2014 to 6 million in 2043, according to the VA’s projections, meaning that those personnel will go from representing 1 in 6 military veterans to 1 in 2.